Random House Trade Paperbacks, 9780812981452, 224pp. In this astonishing debut, Tracy Winn poignantly chronicles the souls who inhabit the troubled mill town of Lowell, Massachusetts, playing out their struggles and hopes over the course of the twentieth century. Through a stunning variety of voices, Winn paints a deep and permeating portrait of the town and its people: a young millworker who dreams of marrying rich and becoming “Mrs. 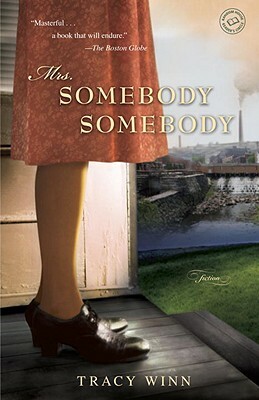 Somebody Somebody”; an undercover union organizer whose privileged past shapes her cause; a Korean War veteran who returns to the wife he never really got to know—and the couple’s overindulged children, who grow up to act out against their parents; a town resident who reflects on a long-lost love and the treasure he keeps close to his heart. Winn’s keen insight into class and human nature, combined with her perfect, nuanced prose, make Mrs. Somebody Somebody truly shine. Tracy Winn earned her MFA from the Warren Wilson Program for Writers and has had stories published in New Orleans Review, Alaska Quarterly Review, Hayden's Ferry Review, and Western Humanities Review, among other venues. She works with Gaining Ground, a local nonprofit farm that gives its produce to local shelters and meal programs. She lives near Boston with her husband and daughter.